Award Winning Patent Pending Seating Design Creates "The Finest Lift Chair In The World" Gel Infused Memory Foam To Relieve Key Body Pressure Points. Pirelli® Web Back Inner-­‐Supports Provides the "Perfect Fit" for all Body Contours. 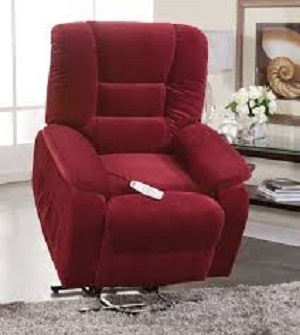 The Ultimate In 3-­‐Position Lift Chair Comfort. Special Noise Reduction Provides Quiet Operation. User Height: 5'4" to 6'4"
Distance from Wall Needed: 16"
Warranty: Certified Technicians will repair, or replace products covered under the “General Warranty” at its discretion, provided that the product has not been put into “commercial use”, been abused in a fashion not normal to everyday residential use, and that the product has not been exposed to fire, smoke, water, extreme heat or cold. The product is covered for the periods stated in the context of indoor residential use to the original owner from the date of purchase. Proof of purchase will be required with any warranty claims submitted. General Workmanship - All goods will be deemed to be free of manufacturing defects for a period of 2 years from date of original purchase. Frame Warranty - All Frames are carefully engineered for long life and are covered for a lifetime. Recliner Mechanisms - All Mechanisms used in Serta Perfect Lift Chairs carry a lifetime replacement warranty. Electronics - All Electronics used in Serta Perfect Lift Chairs are covered for a period of 5 years.